1857-63 Chalon Issue, Serrated Perf. 16/18 at Nelson , Unwmkd. 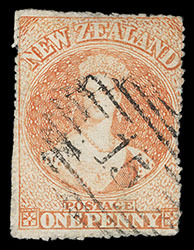 New Zealand, 1862, Queen Victoria "Chalon Head", 1d dull orange, serrated perf 16/18, unwatermarked, cancelled by numeral "15" barred oval of Nelson, showing serrations on all sides, small thin at top, Very Fine appearance; with 1973 R.P.S.L. certificate. Scott No. 7b. Campbell Paterson No. A1d (W). SG No. 22 £5,000 ($6,570). A RARE EXAMPLE OF THE 1858 1D RICHARDSON PRINTING ON WHITE PAPER WITH ROULETTING TRIAL SEPARATION. New Zealand, 1862, Queen Victoria "Chalon Head", 6d brown, serrated perf 16-18, unwatermarked, showing serrating on all four sides, top being inside design, tied by numeral "15" barred oval of Wellington on small gray piece with red "London, Paid, SP 18 62" cds below, Very Fine, Major Henry Dumas, Spink, March 2000, lot 103; with 1958 R.P.S.L. certificate. Scott No. 9b. Campbell Paterson No. A5a (V). SG No. 24 £3,500 ($4,600). 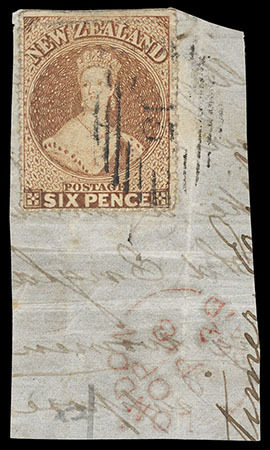 A RARE EXAMPLE OF THE 1862 6D BROWN WITH TRIAL SEPARATIONS. 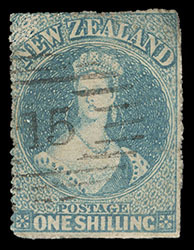 New Zealand, 1862, Queen Victoria "Chalon Head", 1s blue green, serrated perf 16/18, unwatermarked, sharp numeral "15" barred oval of Nelson, serrates showing on three sides, beautiful vibrant color, repaired at top left and tiny thins, Fine appearing example of this exceptionally rare trial separation; with 2017 R.P.S.N.Z. certificate. Scott No. 10b. Campbell Paterson No. A6c (V). SG No. 26 £6,500 ($8,540).